Model: Airwair. Color: Cherry Red. Material: Velvet. Anthropologie by Farylrobin. Dav Red Boot. Color / Material: Deep Red / Suede, Velvet. • Velvet pattern back panel. ♥♥ If you are looking for high quality, you will love this shoe. Size: 38 ( Insole 9.5" ). Insole: 9.75". Width: 2.75". Heel to Toe: 9.75". Steve Madden Floral Velvet Black Booties. Beautiful floral design throughout. Heel height is 3”. Designer: Lord And Taylor 424 Fifth. Style: Black Velvet Studded Buckle Strap Accented Side Zip Block Heel Ankle Boot. Material: Man Made Velvet. Overall In Excellent Condition. Best Deal. 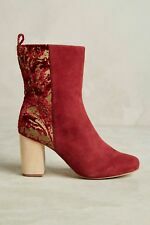 Velvet Glamorous Ankle Boots are a fantastic pair for any occasion to easily pair with a formal, or casual occasion, babe. Dr. Martens green Ze You velvet boots.Ze You velvet is a fine velvet fabric. Made in England. 8 Eye 1460 Pascal boots. I ALSO HAVE THESE IN A SIZE 6.5 THAT ARE LISTED. 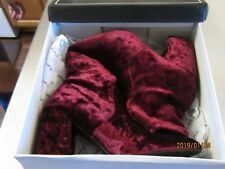 SUPER CUTE AND NEW IN BOX ONE PAIR OF ADORABLE MADDEN GIRL BOOTS IN LADIES SIZE 7. THESE ARE A VELVETY FABRIC WITH LOTS OF BEADS, STUDS AND RHINESTONES ON THE SIDE. UGG W GENE MODEL 1098529 w BLK. New in box size 6.5. Size EU 37.5. New in box.